Due to a transient misconfiguration, my parents' clothes washer leaked some water into the catch tray in which it sits. My dad asked me to sponge out the water, and while doing so, I pondered how to get the water in parts of the tray I couldn't reach (which was the majority, due to the washer's location). I asked my dad if he thought there might be a way to tilt the washer and tray to get all the water on one side . . . and asking him that was my mistake. The only way to tilt them for long enough to get all the water out would be to have one side sit on something, but due to the unreachable location of the washer's feet, stuffing a support beam under the tray arbitrarily (and then letting the washer sit back down) would just cause deformation and damage to the tray. I suggested using a fan to just blow-dry the tray over an extended period, but my dad completely ignored me. He tried to slide the washer and tray together into a position where the washer's feet would be reachable, so that the support beam could go under them, but the tray wouldn't budge; all he got was the washer up against the side of the tray, so that I couldn't even fit the sponge in anymore. I emphatically repeated my blow-dry suggestion, but he ignored me again and pondered aloud why the tray hadn't moved. I said the tray was probably not budging because it was stuck to the floor, after decades of immobility, and reiterated my totally risk-free idea, asking why he didn't want to do it. Once more, I was ignored, and he went about trying to pull the tray up from the floor--and tore a hole somewhere in the tray. Water began leaking out of it onto the floor. I frantically began sponging away the leak, fuming, "This is exactly what I was afraid would happen!" I really, really don't understand why the guaranteed-safe, guaranteed-effective method I brought up three times went completely unacknowledged, in favor of a method with high risk of damage that, whaddaya know, ended up causing damage indeed. What ended up happening with that coworker? But it's a figure of speech, when something is obvious (in this case, the awfulness of twitter), it's not a real surprise. I was under the impression that Sniper was saying he hated Twitter because there was a surprise that got spoiled for him by reading tweets. I fell asleep on the drive home. Don't do that. I blanked out for maybe only 3 seconds once on a short drive while really tired from physical activity (but not aware that I was such, until the boring drive dulled my senses). Ended up crossing the double yellow line during a curve in the road. Pure luck that there was no oncoming traffic at the moment. You guys should be happy you're not on Twitter. Does it count if I'm on Twitter but never look at the home timeline? What do you look at then? Don't you have a wet/dry vacuum? A fan would have taken days, possibly more depending on the humidity of the room. There's also the possibility of electrocution, which seems all too likely based on my knowledge of you. I don't think you get ignored, Freelance, so much as leave people at a loss for words. What? I don't think I like what you're insinuating, and I don't mean being ignored online. I mean with my family. Oops, I didn't meant to insinuate anything, and rather than dig deeper trying to explain, I will just apologize. Sorry. You are forgiven, young shellback. 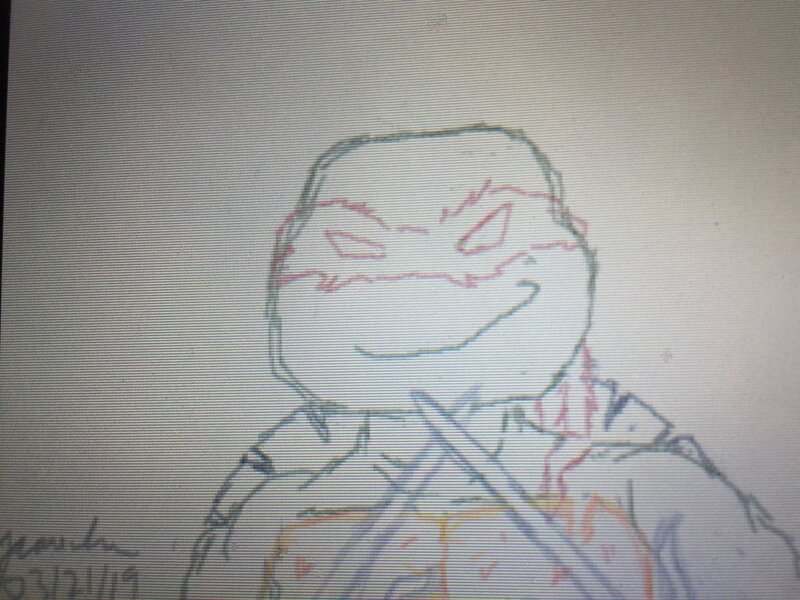 I drew the best turtle last night. Here it is. Getting annoyed with how good Alita is supposed to be. Bunch of dumbass show offs. Nobody gives a damn about your highlights! I wrote posts about Alita on February 15th (http://www.pspminis.com/forums/topic/movie-suggestion/page/40#post-51747 ), February 21st (http://www.pspminis.com/forums/topic/movie-suggestion/page/40#post-51765 ), and March 15th (http://www.pspminis.com/forums/topic/movie-suggestion/page/40#post-51818 ), and only now are you feeling annoyed? That's quite a long incubation period--though I don't think I hyped the movie up all that much, even if I did enjoy it a great deal and hope a sequel happens someday. Captain Marvel has grossed well over $300 million domestically already, and over $900 million globally, so no matter what any individual opinion is on its quality, it has clearly found an enthusiastic audience (haven't seen it yet myself). Alita, meanwhile, is a hair under $400 million globally, after more than double the amount of time in theaters. :/ People are simply more likely to go see something they have some familiarity with. Those dumbasses keep bringing up alita every time captain marvel is mentioned. Car rotor replacement is happening. Dammit I’m still getting a ps4! Parents' water heater started leaking overnight and/or this morning. Big chunk of basement carpet soaked. :( Not sure what's wrong; we might have to get the whole unit replaced. In other bad news, this has been one of my worst tax filing experiences ever, thanks to the move last year. I tripped over the holey part and sprained my ankle! Hope it heals in a few days. Ack! I got just robbed. Though not of anything particularly important. A white pickup drove in. I thought it was the guy who cut my hay, who has a multitude of trucks. Went down to the old shed where there is hay. I thought he was getting some. Then the truck comes rushing out, loaded with a bunch of old furniture also in the shed, including a large antique globe. I chase after it but obviously a guy on foot can't chase a truck. I take it you didn't see the license plate number? Any suspects come to mind? It sure seems like someone who would be familiar, if they already knew there was stuff they could steal there. Hope your sprain heals quickly, Sniper. At least you tripped over the holey part and not the holy part. The ankle is much better, doesn’t hurt as much when I walk so it’s good. So I ask him what the heck he thinks he doing. And he says, he's taking the car. And I'm like, "Dude, it's my car.". And then he goes, "I thought it belonged to ______", _____ being that neighbor/friend of mine that died five months after my father did (but before he did, helped me a lot with the aftermath of my father's death). While I say neighbor, he technically lived on my family's farm, in the old farmhouse. In theory he was the handyman and did odd jobs in lieu of rent, though he rarely ever did. Really we just wanted someone living there. After a rant and waving my shotgun around, I just told him to get out of here, which he did. So I guess that's who has been stealing. Supposed "friends" of his, who thought my stuff was his stuff. Though I don't understand why they think they were entitled to it. And his actual family grabbed all his stuff as quick as they could. They were like vultures. And also, yesterday, I twisted my ankle in a rut in the road. It's weird. It doesn't hurt exactly, it's like when you hit your funny bone, it hurts but it also sort of tickles, I want to laugh. I like the Dunk and Egg books, set in the AGOT universe. I would trade the whole of AGOT for a dozen more Dunk & Egg stories.